If you’re flying Seair anytime the month of February and March 2013, check out the latest issue of Seair InFlight Magazine. 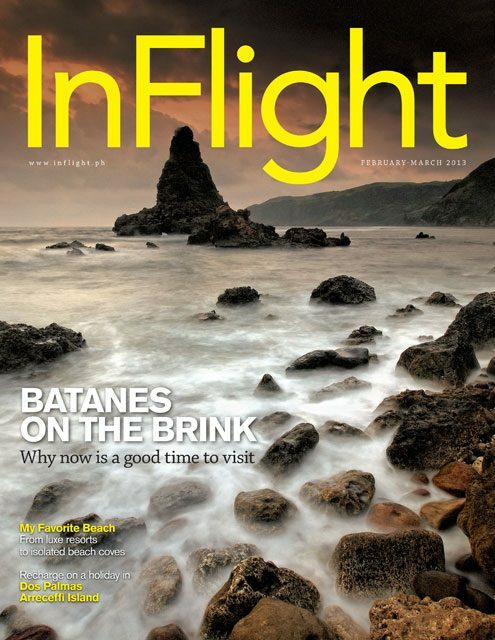 My image of Diura Batanes Seascape is on the cover. Many thanks for Seair for picking this one out, it also marks the best season to go to Batanes. Aside from the main feature article on Batanes, check out the “My Favorite Beach” articles to get an idea where to spend summer. I’ve been living in Palawan for almost 3 months now. 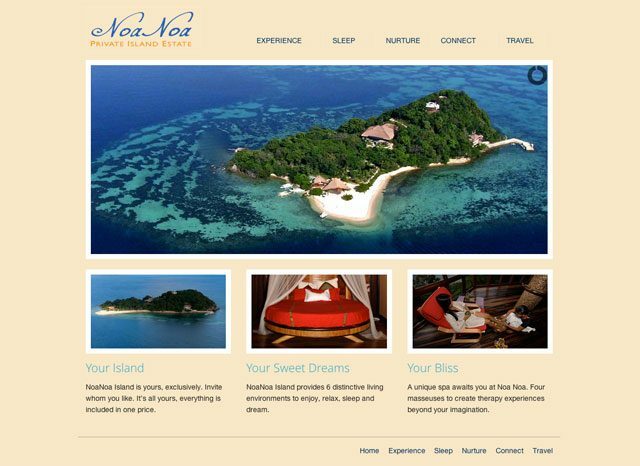 I’m currently based in El Nido, Palawan taking up a temporary job here but prior to that I worked on a very exciting project in Taytay for NoaNoa Island, a Palawan Private Island Estate that is now open for rentals and bookings. 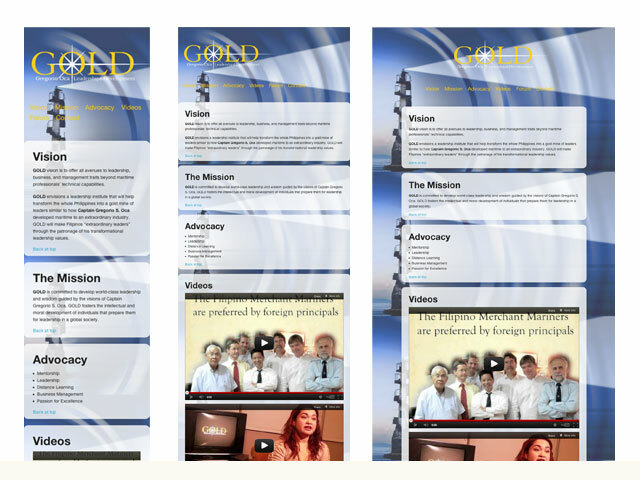 I stayed in the island for 11 days working on the design and also taking some of the photographs for the website. It’s quiet, serene and the reef surrounding the island is probably the best snorkeling I have seen. (Take a look at my Underwater Shots here). If you happen to be flying Philippine Airlines this month of November 2012, do check out their latest Mabuhay Magazine onboard. I got a short two-page story there on our brief stint in North Sulawesi, Indonesia. 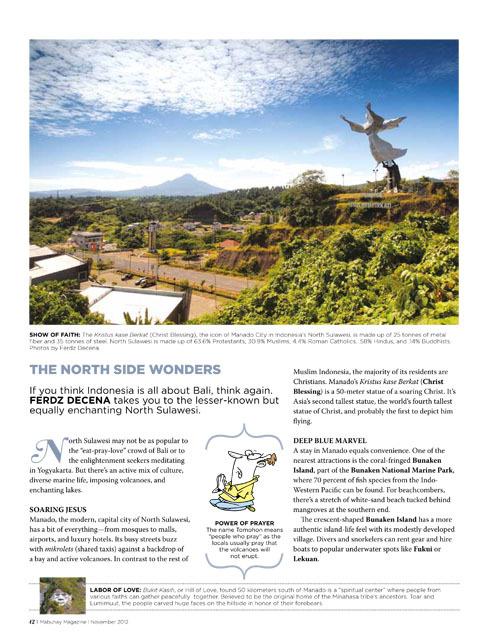 It’s a very interesting place covering Bunaken Island, Manado and Tomohon. Look for the article “The North Side Wonders”, below are the photos they used for the article. It’s that time once again where a lot of magazines would feature destinations apt for the rainy season and also the Halloween. On the latest Seair InFlight Magazine Oct-Nov 2012, their cover story “The Isles of Thrills“, adventure specialist Greg Hutchinson takes you to the places in the Philippines where you can Kayak, Trek or Bike Around. On the Insider’s Guide section, Paranormal Expert, Frank Regis takes you to 10 Haunted Places to spook you. Somewhat a rehash of an old feature they did before. I included here some spreads and a page where some of my photos were used. So if you are flying Seair/Tiger anytime soon, check it out in-flight. One of my favorite images from Sagada is published on the October 2012 Issue of PAL Mabuhay Magazine. It’s this boy kneeling on the ground at the cemetery in Sagada during the Festival of Lights celebration or Panag-apoy during Halloween. I just can’t believe it’s been almost 7 years since I took this photo. I was still using my trusty Olympus C750 point and shoot at that time. No DSLR for me then but I thought this picture captured the essence of the festival, remembering the loved ones by burning a pinewood fire or saeng. 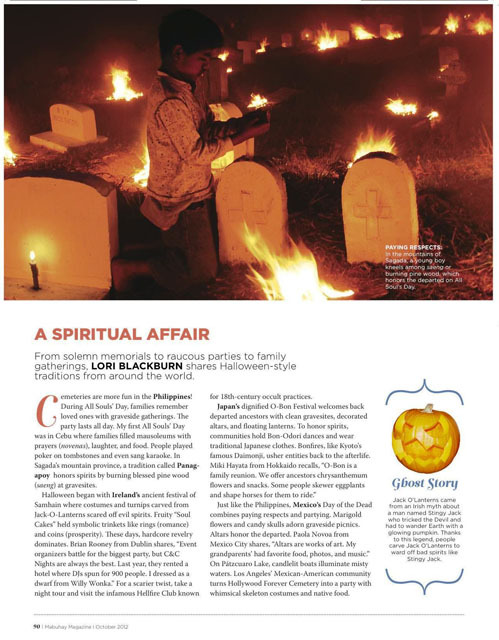 Lori Blackburn writes about it more on this issue as well as the other Halloween traditions around the globe.